﻿ Romans 11:6 and if it be by favour, it is not upon the account of merit. for then mercy would not be mercy. and if it be by favour, it is not upon the account of merit. for then mercy would not be mercy. But if this is by grace, then it is no longer on the basis of actions. Otherwise, grace would no longer be grace. And if it is by grace, it is no longer from works, otherwise grace becomes no longer grace. But if it is from works it is no longer grace, otherwise work is no longer work. But if it is by grace (His unmerited favor and graciousness), it is no longer conditioned on works or anything men have done. Otherwise, grace would no longer be grace [it would be meaningless]. And if [they were selected] by God's unearned favor, [then] the choice is not based on the good that people may do. Otherwise, God's favor would not be [really] unearned. And if the election is by grace, it is no longer by works; otherwise grace is no longer grace. 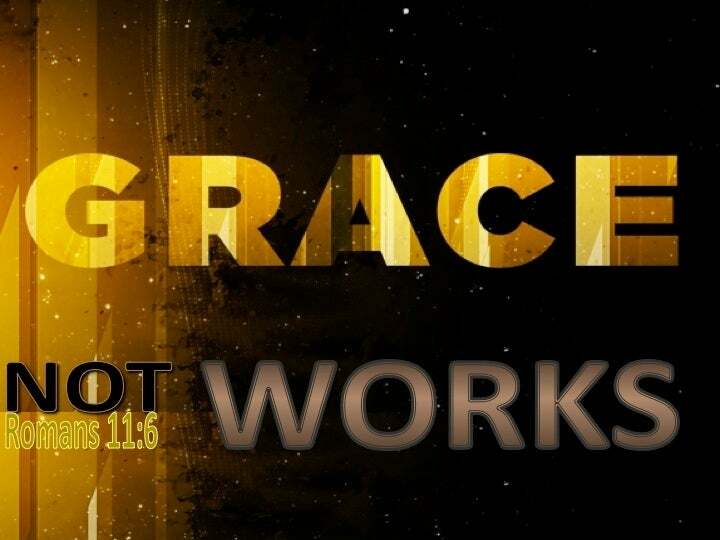 But if it is of grace, then it is no longer of works: or grace would not be grace. And if it is by grace, then it is no longer on the basis of works; otherwise, grace would no longer be grace. But if by grace, no longer of works: since otherwise grace is no more grace. 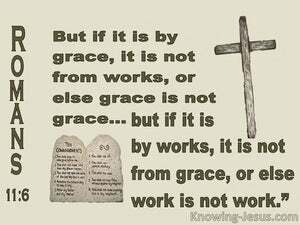 and if by grace, it is not at all by works: since in that case grace is no more grace. But if it is by his mercy, it is not for anything they have done. Otherwise, his mercy would not be mercy at all. But if by grace, then it is no more of works: else grace is no longer grace. And if it be of works, then it is no more grace; else work is no longer work. And if by grace, then is it not by works; otherwise, the grace is no longer grace. But if it is of works, then it is no longer grace; otherwise, the work is no longer work. And if to grace, it is no more of works: otherwise grace is no more grace. And if of works, it is no more grace: otherwise work is no more work. But if by grace, [it is] no longer by works, for otherwise grace would no longer be grace. But if by grace, then it is no more of works; otherwise grace is no more grace. But if it is of works, then it is no more of grace; otherwise work is no more work. 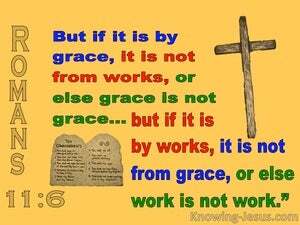 If it be of grace, then is it not of works. For then were grace no more grace. If it be by the deserving of works, then is it no more grace. For then were deserving no longer deserving. Selected by grace, and therefore not for anything they have done; otherwise grace would cease to be grace. 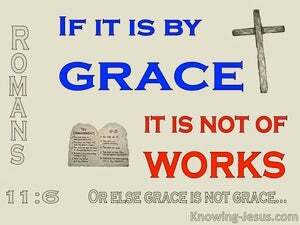 But if it is by grace, it is no longer of works; or else grace is no more grace. And if by grace, then it is no longer of works; otherwise grace is no longer grace. And if it is by grace, it is no longer on account of works; otherwise grace ceaseth to be grace; but if it is of works, there is then no grace; otherwise work ceaseth to be work. How is it then? but if by grace, no longer by works; for otherwise grace is no longer grace; but if by works, it is no longer grace; for otherwise a work is no longer a work. If, however, by favour, no longer of works; else, favour, no longer proveth to be favour! But if by grace, it is no more by works: otherwise grace is no more grace. But if by works, it is no more grace: otherwise work is no more work. But if in love, then no longer as a result of obedience. Otherwise love would cease to be love. And if by grace, then is it no more of works: otherwise grace is no more grace. But if of works, then is it no more grace: otherwise work is no more work. But if it is by His unmerited favor, it is not at all conditioned on what they have done. If that were so, His favor would not be favor at all. And if by grace, it is no more of works: for then grace is no longer grace. But if of works, it is no more grace: for then work is no longer work. and if by grace, no more of works, otherwise the grace becometh no more grace; and if of works, it is no more grace, otherwise the work is no more work. what reason then is there for boasting? it is excluded. what, by the ceremonial law? no: but by the law of faith. the law was introduc'd, that the greatness of the fall might fully appear; but the more sin display'd its enormity, the divine favour was so much the more transcendent. it is by the divine favour that I am what I am: and his favour to me was not in vain; no, I laboured more than they all: yet it was not I, it was the divine favour which assisted me. I do not frustrate the grace of God: for if justification be by the law, Christ died to no purpose. Christ is of no use to you, whoever of you seek to be justified by the law; you have lost all interest in the gospel-dispensation.